The Ray Optics Module simulates electromagnetic wave propagation when reflection and refraction are the most important effects. This is the case when the wavelength is short compared with device size. Industrial applications include common optical components such as reflectors, monochromators, lenses and polarizers. 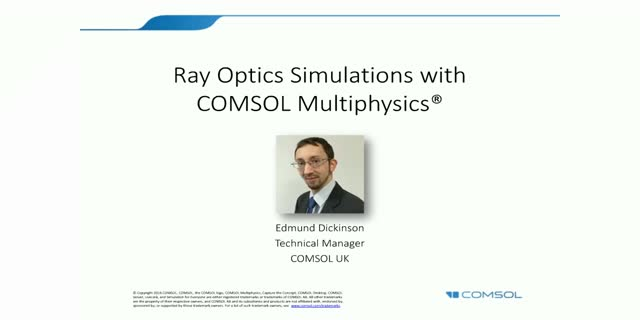 This webinar will introduce the tools in COMSOL Multiphysics® for analysis of geometrical optics, including ray intensity and polarization calculations; ray propagation in graded media; and multiphysics coupling to other physics such as heat transfer. The webinar will include a live demo and conclude with a Q&A session. Dr Christoph Fuehrweger, a medical physicist at the Munich CyberKnife Center, will present the clinical implementation and benefits of the Monte Carlo stereotactic plan QA.